Everyone has their very own idea about how to grill right, but for us, what you’re serving it with is equally important—because let’s be honest, the juiciest steak is nothing without a tangy or herby sauce to complement all that charred flavor. And let me tell you, a real winner in this department is definitely not one of the bottled, store-bought candidates! Whether you like your grilled food spicy or sweet, I’m going make a case that the best barbecue sauces are homemade ones. 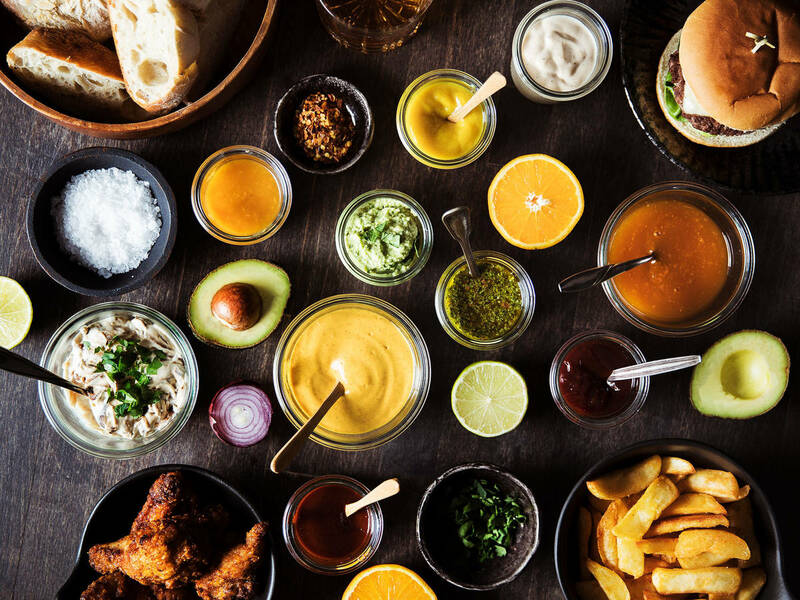 Here are 10 ideas for delicious sauces and dips that you can whip up at home. If you’ve never made your own barbecue sauce at home, now’s the time. This classic homemade barbecue sauce brings out the best flavors in any grilled meat—chicken, pork, beef, you name it. The best way to use it is to only apply during the final stage of grilling: lightly coat the steak in the last 5 min. of cooking time—this will prevent the sauce from burning. Then, for a glossy and tangy final product, coat your meat again during the resting time. We wouldn’t say no to a little extra for dipping, too! What you’ll need: 2 tbsp butter, 1 onion, 3 garlic cloves, 2 cups ketchup, ¼ cup molasses, ¼ cup cane sugar, ¼ cup apple cider vinegar, 2 tbsp mustard, 1 tbsp chili powder, salt and pepper to taste. How to make it: Finely chop onion and mince garlic. Melt butter in a pot set over medium-high heat. Add onion and garlic and sauté for 2 – 3 min., or until softened and fragrant. Add ketchup, molasses, cane sugar, vinegar, mustard, and chili powder and stir to combine. Reduce to medium-low heat and let simmer for 1 – 2 min. Transfer sauce to a liquid measuring cup and blend until smooth, using an immersion blender. Allow to cool before serving or store in the fridge for up to one month. The traditional Alabama white barbecue sauce is a combination of mayonnaise, vinegar and punchy aromatics. The thick sauce is a great companion to chicken wings but is equally a welcome change to plain ol’ mayonnaise in a burger. What you’ll need: 2 garlic cloves, 2 tsp horseradish, 1 ½ cups mayonnaise, ¼ cup water, ¼ cup white wine vinegar, 1 tbsp mustard, 1 tsp sugar, salt and pepper to taste. How to make it: Add all ingredients to a food processor and blend until smooth. Allow to cool before serving or store in the fridge for up to 1 week. This tangy, mustard-based sauce is both sweet and spicy which make it a hit on burger, grilled or pulled pork but also a great match with ribs and grilled chicken. What you’ll need: ¾ cup mustard, ¾ cup cider vinegar, 1 tbsp cane sugar, 1 ½ tbsp butter, 2 tsp salt, 2 tbsp Worcestershire sauce, 1 tsp pepper, and 2 tsp hot sauce. How to make it: Add all ingredients to a pot and whisk. Let simmer for approx. 20 min., stirring occasionally. Allow to cool or store in the fridge until serving. Caramelized onion dip is super easy to make and will keep your guests happy while they wait for the grilled goods to be served. It’s and perfect for dipping fries, potato wedges, ruffle-cut chips, or even crudités. What you’ll need: 2 large onions, 3 garlic cloves, 2 tbsp butter, 1 tsp sugar, ½ tsp paprika powder, 7 oz cream cheese, 1 cup sour cream, salt, pepper, and parsley for garnish. How to make it: Slice onions and mince garlic. Melt butter in a frying pan set over medium-high heat. Add garlic and onions, and sauté for 5 min., or until brown and soft. Season with salt and pepper. Reduce heat, add sugar and cook for 5 min. more, or until caramelized, stirring constantly. Allow to cool and combine with cream cheese, sour cream, and paprika powder. Season to taste with salt and pepper and garnish with chopped parsley. This twist on a barbecue sauce is the perfect combination of sweet, savory, and spicy thanks to classic Asian additions like fresh ginger, soy sauce, and rice vinegar. It’s a great all-purpose barbecue sauce that you should definitely try brushed over chicken wings and ribs. What you’ll need: 1 cup ketchup, ½ cup Dijon mustard, ½ cup cane sugar, ½ cup rice vinegar, 1 tbsp freshly grated ginger, 1 tsp soy sauce, and 1 tsp sesame oil. How to make it: Add ketchup, mustard, cane sugar, vinegar, ginger, soy sauce, and sesame oil to a pot or saucepan and simmer for approx. 5 min, stirring occasionally. Remove from heat and allow to cool to room temperature. This traditional Argentinian chimichurri sauce is typically used to marinate or accompany grilled meats but is so versatile that you can also drizzle it on grilled cheese, potatoes, or bread and even use it as a winning summer salad dressing. This fruity yet spicy dip is always a conversation starter a barbecue buffet. It’s tasty as a dip for fries (goodbye for now ketchup!) but also perfect served with chicken or turkey steaks. What you’ll need: 1 mango, 1 cup cream cheese, 2 tsp curry powder, ½ lime (juice), 1 chili, salt, and pepper. How to make it: Finely chop chili. Peel and roughly dice mango, then add to a food processor. Blend until smooth, then add chili, cream cheese, curry powder, and lime juice. Blend again and season to taste with salt and pepper. This boozy bourbon-based barbecue sauce (say that three times fast) is super simple to make and tastes fantastic on pork chops, chicken, ribs, and fries! While the bourbon, inevitably, adds depth and aroma, honey helps to sweeten and tone it down. What you’ll need: 1 cup ketchup, ½ cup bourbon, 3 tbsp honey, 3 tbsp apple cider vinegar, 2 tbsp Worcestershire sauce, and 1 tsp soy sauce. How to make it: Add all the ingredients to a pot and bring to a boil. Reduce heat to medium-low heat and let simmer for approx. 10 min, stirring often. Think you know your avocados? Guasacaca is the Venezuelan version of guacamole. It's vibrant, creamy, fresh, and bursting with delicious flavor! The smooth sauce is perfect for dipping bread or serve it with some grilled vegetables or cheese. If you like it a bit spicier, you can add more jalapenos or pepper. What you’ll need: 2 avocados, 1 onion, 1 jalapeno, 2 cloves garlic, a handful of fresh cilantro and parsley, ¼ cup white vinegar, 1 lime (juice), ½ cup olive oil, salt, and pepper. How to make it: Peel and roughly dice avocados. Roughly chop onion, jalapeno, parsley, and cilantro. Transfer avocados, onion, jalapeno, garlic, cilantro, parsley, vinegar, and lime juice to a food processor and pulse until everything is finely chopped. Add olive oil and blend again, until smooth. Saison to taste with salt and pepper and garnish with some cilantro or parsley. This Hawaiian inspired sauce gives a tropical twist to your regular barbecue routine. It’s perfect for basting chicken and ribs on the grill, but you could also spread it on burger or mix it into pulled pork. What you’ll need: 8 oz canned pineapple, ½ mango, ¼ cup orange juice, 3 cloves garlic, 1 tbsp ginger, ¼ cup cane sugar, 1 cup ketchup, ½ cup soy sauce, ¼ tsp white pepper, and ½ tsp chili powder. How to make it: Mince garlic and ginger. Peel and dice mango. Add all the ingredients to a pot and bring to a boil. Reduce heat to medium-low and let simmer for approx. 30 min., then blend until smooth. Allow to chill for 2 – 3 hours before serving. Enjoy! Do you have a favorite homemade barbecue sauce or dip? Send your recipe to community@kitchenstories.com for everyone to enjoy!